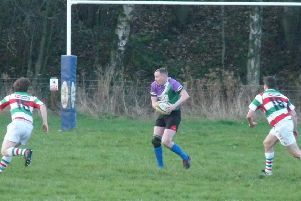 Buxton Stags’ first competitive outing of the season produced an extremely credible result after they were beaten 42-12 at National 2 Macclesfield. The Stags played a Macclesfield 22 fielding several first team squad members as well as some of their new signings hoping to impress. The fixture was an ambitious project as Director of Rugby Karl de Groot explained. “I wanted to challenge the boys and see where we were,” he said. “Macclesfield play at national level, they are a quality outfit, some four levels above us, so the fixture was always going to be beyond us. “But allowed me to benchmark where we are and perhaps what is possible moving forwards. “We have been under pressure numbers wise at training, so given the limited set piece work that we had done the result was very pleasing. “Once we adapted to the pace change the boys were competitive for some substantial periods of play, scoring twice in the first half and holding our own, late in the second, which in its self tells a story. Scores on the night were Ben Austin and New signing Dan Hay, with Matt Lomas converting the first.